A Quote: “What chance do we have? The question is, what choice? Run, hide, flee, scatter your forces! ● Family History: Jyn Erso is the daughter of renowned Imperial scientist, Galen Erso. Years earlier, this familial connection caused her guardian Saw Gerrera to eventually abandon Jyn, out of fear that discovery of her identity would endanger his group of insurgents and their cause. Prior to learning that Galen Erso still lived, Jyn had decided that her father was already long dead. Once she discovers that Galen is alive, and after learning of his sabotage and sacrifice, saving her father, and doing all she can to realize this new hope for the galaxy, becomes a driving force for Jyn. ● Trust: Jyn Erso has spent half her life burying a past of grief and abandonment, paving it over with a steely resistance and recklessness. After losing her family, and growing up as a child soldier in Saw Gerrera’s militia – only to later be abandoned by them, Jyn has suffered losses that have left her with little capacity to trust anyone. She refuses to allow herself to be drawn back into larger causes, even nobles ones, lest she lose everything yet again. This stance changes, however, once she sees the message sent by her father. Capsule: Liana Hallik. Tanith Ponta. Kestrel Dawn. A cloud of aliases surrounds Jyn Erso to the extent that hearing her true name for the first time in years gives her pause. She has spent half her life burying a past of grief and abandonment, paving it over with steely resistance and recklessness. She has little purpose other than surviving. Doing so often puts the Empire on the receiving end of her well-learned violence, but her attacks at these oppressors are not politically-motivated. “I’ve never had the luxury of political opinions,” Jyn would later claim. Born at the start of Clone Wars, Jyn spent her early years on the move with her parents, Lyra and Galen, dodging galactic conflict. Her father’s enlistment in Imperial scientific research transplanted the whole family to Coruscant, but his crisis of conscience led them to flee Imperial attention – an exit facilitated by Saw Gerrera. Life on the planet Lah’mu was simpler. Right and wrong were clearly defined under the guidance of her Jyn’s mother Lyra, a strong and spiritual woman. Saw would reappear in Jyn’s life when the Empire came for her father once again. It was Saw who rescued Jyn when she was seemingly orphaned on rural Lah’mu, and she soon became a child soldier in his private war against the Empire. From the ages of eight to sixteen, Jyn remained a soldier in Saw Gerrera’s roving band of insurgents – a group of rebels operating on Onderon who fought so dirty that their actions were disowned by the core Rebel Alliance leadership. Jyn found connection with the hardened warriors, but after a crippling setback was suffered by the group, Saw abandoned Jyn. Despite her having become the best soldier in Saw’s rebel cell, the teenager was on her own once again. And the effect of such losses throughout her life have left Jyn with little capacity to trust anyone. Jyn’s time with Saw Gerrera’s rebels has taught her a range of survival skills. She has become a tough hand-to-hand combatant. And though she excels with improvised weapons, Jyn favors paired truncheons, which are effective even against stormtrooper armor. Her litany of crimes against the Empire include both Class One infractions – aggravated assault against Imperial military personnel and escape from custody – and Class Two infractions – possession of unsanctioned weapons; forgery of Imperial documents and resisting arrest. 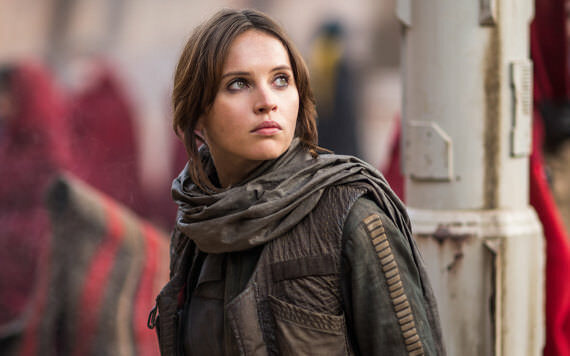 Alliance Intelligence has now pieced together a hazy picture of Jyn’s past, including her tenuous connection to Galen Erso, the renowned scientist who vanished under mysterious circumstances. When reports linking Galen to a secret Imperial weapons development program surface, the Rebels launch a mission to recover Jyn from imprisonment in an Imperial labor camp on the planet Wobani. For Jyn, it’s the trade of one prison cell for another. She cares not for the cause of the Rebel Alliance, and being briefed by their command while still in binders does little to sway her. Until, that is, she hears about her father – a man she decided had died many years ago. Jyn’s icy attitude melts away upon later hearing the truth of the matter from her father in his own words, and upon witnessing the unthinkable power of the Empire with her own eyes. She entreats the Alliance leadership for support, but is met with skepticism and maddening indecision. However, her stirring rally cry does not fall on deaf ears. It is due to Jyn Erso’s inspirational call to arms that the unsanctioned Rogue One operation comes into being. And it is due to the actions of Jyn Erso and those of her team of brave volunteers that a mission so vital to the survival of the Rebellion proves successful – and pivotal to the eventual undoing of the Empire. Equipment: Cold weather survival gear (+1D vs. the effects of cold temperatures), Crozo-2-MAL personal comlink, goggles, holster, insulated mechanic’s vest (+1 vs. the effects of cold temperatures), kyber crystal pendant (gifted to Jyn at age eight, by her mother), nondescript worker’s tunic, stolen BlasTech A-180 blaster pistol, truncheon (STR+1D damage, Easy melee difficulty, Game Notes: Equipped with tonfa-style handle. Collapsible. When in collapsed form, grants +2D to attempts at its concealment), utility vest. Sources: Rogue One: A Star Wars Story film, Star Wars: Rogue One: The Ultimate Visual Guide, Star Wars: Rebel Rising novel, and Wookieepedia. Biographical text adapted from Star Wars: Rogue One: The Ultimate Visual Guide (pages 34-35). Stats and additional text by Telsij. to forget, I told myself it was for a cause that I believed in. A cause that was worth it. Without that, we're lost. ● Remorse: Cassian has always kept a cool head under fire, but he is haunted by a number of the morally ambiguous missions he has undertaken in the name of the Rebellion. 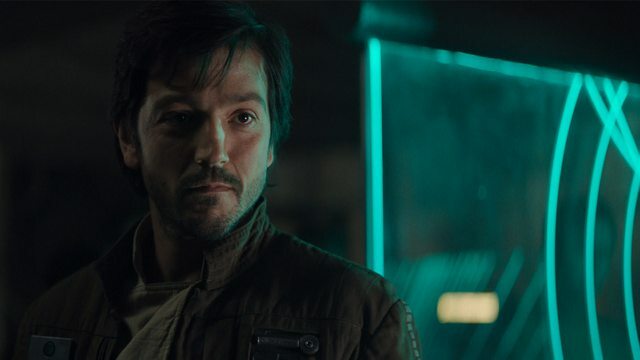 Though he convinces himself that such sacrifices must be made for the greater good, the internal ethical conflict brought about by his wartime deeds has taken a toll on Cassian’s psyche nonetheless, despite his status as one of the Alliance’s most loyal and steadfast soldiers. Capsule: An accomplished Alliance Intelligence officer with extensive undercover and combat field experience, Captain Cassian Jeron Andor is a disciplined operative with a deep respect for the chain of command and for carrying out unquestioned orders if done so for a noble cause. Also known by the aliases Willix, Aach, Joreth Sward, and by the title Fulcrum — an alias used by key rebel spies in the years leading up to the Battle of Yavin — Andor has earned respect from agents under his command, due to his ability to keep a cool head and complete his missions using minimal resources. Now in mid-twenties, Andor grew up in the wilds of the Outer Rim, and came of age fighting against the Republic during the tumultuous Clone Wars. His father was killed at Carida military academy during a protest against the expansion of Republic militarism. Though not a formal Separatist, Andor became part of a Confederacy-backed insurrectionist cell at a young age, throwing rocks and bottles at Republic walkers and clone soldiers. He came to learn firsthand that even the most advanced combat machinery could be crippled if the right grit were sprinkled into the right areas. In the time of the Empire, Andor was drawn into anarchist movements that continued to defy Imperial edicts, and he was soon recruited by General Draven into the growing Rebellion. The fledgling Rebel Alliance relies heavily on covert operatives to stymie Imperial operations. These strikes are discreet and targeted. Acts of sabotage, espionage and even assassinations fill Andor’s casefile. Knowing from experience the efficacy of Imperial interrogation, Andor respects the need for secrets to be kept from field agents. He remains active to stave off the downtime that would plunge him into deeper reflection on some of his most extreme assignments. Cassian had spent most of his career in Alliance Intelligence working for the Operations department – a dangerous posting that places agents directly in contact with the Empire. Statistics place the odds of an agent surviving twenty field missions at twenty-three percent – roughly four-to-one odds against. Cassian’s years of law-bending have honed his escapology skills however, and have allowed him to develop a network of contacts throughout the underground – sources of information both trustworthy and unscrupulous enough to be of aid to Cassian in his more morally-ambiguous missions. Intelligence command has only recently transferred Andor to the Retrieval department, where his mandate is to plan the operation to free Jyn Erso from prison, to lead the search for Saw Gerrera and Imperial scientist Galen Erso. Equipment: Alliance rank insignia (Pips on badge denote status as Captain; color indicates army service), BlasTech A280-CFE blaster, compact security kit in sensor-baffling wallet (hidden in boot; +2D vs. detection of kit by sensors, +1D to security checks), Corellian-cut field jacket, personal identifier transponder (conceals “lullaby” suicide pill), military fatigues, weatherproof vest (+2D vs. waterlogging). Sources: Rogue One: A Star Wars Story film, Star Wars: Rogue One: The Ultimate Visual Guide, and Wookieepedia. Biographical text adapted from Star Wars: Rogue One: The Ultimate Visual Guide (pages 52-53) and Wookieepedia. Stats and additional text by Telsij. TIBBS OSPE, from Tales From Vandor, owner of the Lodge from SOLO: A Star Wars Story. (Thus far, his species is unknown — and so, I will amend his entry once new information comes to light! ● Horns: Tibbs has bony protrusions atop his head — one larger central horn and two smaller ones on each side. The horns inflict STR+1D damage, if used in combat. Tibbs doesn’t like to talk much, but over the years I’ve learned his story. He was a Commerce Guild scout back before the droid war, flying a Vandaard Pathfinder out beyond the void of Chopani in search of valuable new planets. That’s how he found Vandor, tucked away in an ancient scout’s report. It was settled centuries ago, but turned out to be too far from the main trade routes to prosper. So after a couple of generations most of the settlers packed up and looked for a new home. TIbbs saw things had changed and thought Vandor might make for a good stopping place for traders heading toward Deneba and Manda. So he fixed up the ruins of the old Ypsobay Trading Company headquarters, filled in the craters in the old landing strip, and let folks know they could find food and fuel Ypso. And if they needed a place to spend the night or blow off a little steam, they could visit the Lodge. Equipment: Blaster rifle (5D damage, range: 3-30/100/300, ammo: 100), comlink, fur-collared vest (+1 to resist effects of cold temperatures), general purpose scanner (grants a +1D bonus to search rolls. Device can scan to a range of 1,500 meters, but more than 1 meter of solid rock or metal blocks its sensors. Can detect movement, find life forms and monitor comlink signals. Scanning for life forms or comm signals requires a Difficult sensors roll), monocle ocular enhancer (+2D to search in darkness or dim-lighting; fitted over right eye), mountain boots, spacer’s togs, toolkit, utility belt, Vangaard Pathfinder scout ship. Sources: Tales From Vandor by Jason Fry and Wookieepedia. Capsule text and images: Tales From Vandor (book pages are unnumbered). Stats by Telsij. being more recent entries, are straight up R.a.W. write-ups! Aquatic: Grindalid can breathe both air and water. In addition, fertile female Grindalids must lay, hatch and care for their hatchlings underwater. Dark Vision: Grindalids can see in darkness or low-light conditions without penalty. Lesser Limbs: Grindalids’ primary forelimbs function as do those of a typical humanoid. However, their numerous smaller limbs, though less-developed, aid them in certain functions as well. In game terms, for every full 2 meters in length that a Grindalid’s body has, the various smaller pairs of limbs which run along that 2 meter length of body grant a +1 bonus to running, climbing/jumping, or swimming skill rolls. For example, Lady Proxima’s 4.88 length grants her a combined +2 bonus to her running, climbing/jumping or swimming skill rolls. Maternal Instinct: Matriarchs of Grindalids family units are devoted to their hatchlings. They will prioritize the survival of their children above those of others and other relations. Matriarchy: Groups of Grindalid are often ruled by the female leader. Males are subordinate to fertile females in particular, even if a given Grindalid woman is not their biological mother. Photosensitive Skin: The Grindalid homeworld has a dense atmosphere that filters out most light, meaning that direct sunlight is dangerous to the species. For this reason, most Grindalids tend to remain in the dark depths of planets with stronger sunlight. In game terms, for every round that a Grindalid is exposed to direct sunlight, she suffers damage — with the injury manifesting as a painful, bubbling burn. The first round incurs an automatic Stunned result, the second round incurs a Wounded result, the following round a Wounded Twice result, and so forth. The potentially lethal wounds accumulate until the Grindalid can seek appropriate cover. Grindalids that brave the sunlight, like White Worm enforcer Moloch, must wear protective armor or coverings to do so safely. Segmented-Body Control: Although the Grindalids are somewhat slower on land than most humanoids in terms of overall speed, their segmented bodies allow them to be surprisingly agile over the short distances the lengths of their bodies can cover. In game terms, Grindalids that are at least 3 meters in length/height, gain a +1D bonus to brawling attacks, or dodges and parries (depending upon their declared actions), against opponents that are within three meters distance. Sharp Teeth: The Grindalids possess sharp teeth that inflict STR+1D damage if used in combat. Capsule: The fearsome Grindalid matriarch of the White Worms, Lady Proxima rules Corellia’s black market from a tangle of sewer tunnels beneath Corellia’s Coronet City. A briny pool in the central cistern of an abandoned water processing serves as her throne room, where Proxima feeds her hatchlings and commands the urchins known as scrumrats, sending them out to pick pockets and barter stolen goods. With her humanoid “children” at worm, the White Worms form the backbone of Coronet’s black market, making stolen and prohibited goods available to anyone willing to pay the steep price set by Lady Proxima. Equipment: Assorted baubles and trinkets, bejeweled headdress and ornamental plate armor (+1 vs. physical; covers only top/back of head and upper back; provides nominal protection, while collected trinkets, large hoops and discs of mother-of-pearl interlink with the plate armor’s carapace-like construction). Sources: Solo: A Star Wars Story film, Solo: A Star Wars Story: The Official Guide (p.21-22), starwars.com/databank/lady-proxima, starwars.com/news/solo-a-star-wars-story-designs, Star Wars: Alien Archive (p.123), Star Wars: Most Wanted novel, and Wookieepedia. Capsule text adapted from Databank entry and Solo: A Star Wars Story: The Official Guide (p.21-22). Stats by Pietre Valbuena. Image: Solo: A Star Wars Story – The Official Collector's Edition issue of Star Wars: Insider magazine. Species Capsule: The Grindalid homeworld has such a dense atmosphere that little light is let in, giving the native species very sensitive eyes and skin, that are easily damaged on brighter worlds. Not much else is known about the insect-like Grindalid, but, at some point after the fall of the Republic, members of this species formed a criminal gang on Corellia called the White Worms. Sources: Solo: A Star Wars Story film, Solo: A Star Wars Story: The Official Guide (p.21-22), starwars.com/databank/lady-proxima, starwars.com/news/solo-a-star-wars-story-designs, Star Wars: Alien Archive (p.123), and Wookieepedia. Species capsule text adapted from Star Wars: Alien Archive (p.123). Stats by Pietre Valbuena. Image: Solo: A Star Wars Story – The Official Collector's Edition issue of Star Wars: Insider magazine. 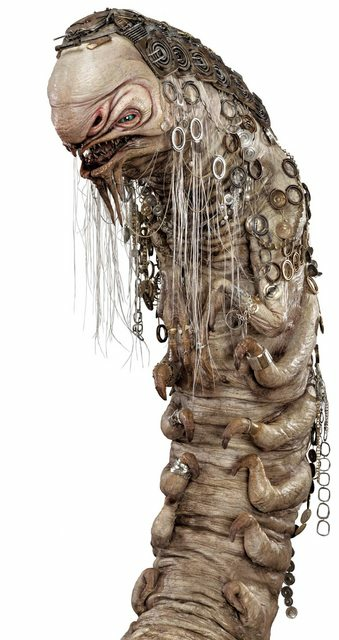 Does anyone else think that there may have been a Duinuogwuin influence on the design of Lady Proxima? I prefer the more traditionally "dragon"-like drawings of the Duinuogwuin from the WEG books, as the color image from the WotC books (and the one used as their main Wookiepedia image) looked too much like a kangaroo (in the face) for my tastes. Also! Apologies for the current hiatus on the Obscure Characters, everyone. I have an illustration gig for a tabletop game (that just got funded!) whose deadlines should wrap up in late February, so all my free time is essentially MIA until then. However, the Obscure Character Archive shall return! A one-night-only engagement! My illustration gig was expanded into mid-April, after originally being scheduled to wrap end of February, so the hiatus continues until *at least* end of April, unfortunately. However! 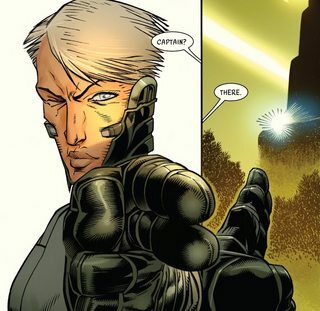 Today, OBSCURE CHARACTER ARCHIVE returns with one of my favorite characters from the current Marvel line of Star Wars comics: Inspector MAGNA TOLVAN from the Doctor Aphra series, a quite capable Imperial whose plight and (spoilers!) tragic arc are sympathetically written and well-developed, even as she begins to fall for Aphra herself. "My mentor — Inspector Thantoh — he always said for some people, order is just control. Power, plain and simple. But when he considered the most strident disciplinarians of all, he proposed a theory — they crave order because they have none in their hearts. And it scares them." Cybernetics: Tolvan has cybernetic prosthetics/braces, for heretofore unknown reasons. Her neckbrace-like cybernetics reach from her collarbone to the back of her head, and she has partially-cybernetic hands and arms. When she was first under the mentorship of Inspector Thanoth, Tolvan did not require any cybernetics, and it is possible that she incurred injury in the line of duty. Tolvan secretly feels shame about her cybernetics and regards them as deformities. Discipline — and distaste for a lack of it: Because Tolvan lives her life by imposing strict order upon it, and by learning Imperial rules and regulations by heart, inside and out, she has little patience for those who do not hold themselves to the same high standards, deeming them "sloppy." Electro-tattoo: Tolvan has had an electro-tattoo which matches that of Doctor Aphra's etched into her left forearm. The tattoo enables communication through secure energy barriers, but may have other uses as well. In Love: Tolvan would — and has — risked her life and her Imperial career to save and protect rogue archaeologist Chelli Lona Aphra. Need for Order: Tolvan is plagued by self doubt, inner turmoil, and thus, a strong desire to exert control over events in her life. Her inner turmoil is kept concealed beneath a veneer of calm and discipline. Background: Magna Tolvan was considered a "candidate for greatness" and in many ways, she attained such heights. With a peerless knowledge of Imperial doctrine and protocol, tactical expertise and strong combat and survivalist skills, Tolvan's well-honed abilities had already made her an exemplary Imperial. Her adherence to Imperial dogma only served make her all the more so. However, the galaxy found a way to confound even those voted "most likely to succeed" at the Imperial Academy. Tasked with overseeing security at Eadu, for the Tarkin Initiative's research and development facility, Tolvan could not prevent the Rebel attack on the base. And it only got worse from there. Thanks in very large part, to rogue archaeologist Doctor Chelli Lona Aphra. After Eadu, Tolvan was assigned the punishment duty of combing the abandoned Imperial base at Yavin 4. There, Tolvan first encountered Aphra and her then-partner the Wookiee Black Krrsantan, the latter of whom made short work of Imperial forces. Pursuing Aphra to the Citadel of Rur, Aphra's party — with the unintended aid of technopathy-controlled droids — overcame Imperial forces once again. And Tolvan was left to ponder her fate, as well as Aphra's parting words that the silver-haired, partially-cybernetic Imperial was "cute." A series of unfortunate events followed once Tolvan was demoted to Lieutenant. Each subsequent defeat came at the hands of Aphra, and through no genuine fault of Tolvan's. But by then, Tolvan had become enamored with the archeologist. At Someilk, the two women even shared their first quiet moment, perhaps first forging a bond, where Aphra opined that Tolvan's cybernetics spoke of an interesting life and were not the deformities the career Imperial saw them as. Sentenced to death by firing squad at Someilk for receipt of her third demerit, Tolvan was spared by the posthumous action of her mentor Inspector Thanoth, who named Tolvan as his legatee. Granted capacity for a fourth demerit because of her transfer to the Inspectorate, Tolvan stalked out alive, admonishing her colleagues' belated realization of this order as "Sloppy." "Investigative branches operate on a four-demerit punitive system, not the three of the field corps. Basic training, Sergeant Major. Article 3, section 9, Memorization is mandatory." Using the Inspectorate's resources and her expert knowledge of Imperial protocol, Tolvan discovered Aphra was a person of interest to none other than Darth Vader. And still it was at this point, that Tolvan began her obsessive pursuit of Aphra in earnest, a woman whom she knew only as Aphra's hastily-conceived alias, "Joystick Chevron." Burdened by the self doubt that her series of perceived failures had brought about, Tolvan had found renewed focus. This new investigation and pursuit promised not only an ability to secure order for her inner turmoil as well as return her to a position of good standing with the Empire, but also, perhaps something more. Chasing Aphra to Wat Tambor's lab on Skako Minor, Tolvan would share her first kiss with the archaeologist, when both believed they were on the verge of being killed by the Chthonic worm god. Though allowed by Aphra to escape, Tolvan instead stowed away with Aphra's crew, killing and skinning the Defel mercenary scout Glashst Ombra in short order, then using her pelt and clothes as disguise. And it would not be the last time Tolvan used disguise to effect an escape. After gaining control of an Allliance flight school headquartered inside a captured Trade Federation capital ship, Tolvan then used her expertise in Imperial officer's doctrine to bypass a suicide order given to her at Hivebase-1. And while Aphra survived the loosing of failed Imperial experiments upon her and her crew — thanks to morally reprehensible actions on her part — Tolvan spirited Aphra away from Rebel custody, disguised as the principled lawman, Tam Posla. Sharing evenings of intimacy at a secluded locale, Aphra would also share her real name with Tolvan, but only upon leaving her, telling her to forget about her, lest harm come to the Imperial. Tolvan had her wits about her, however, having planting a microtracker on Aphra's person. Tracking Aphra to the crime syndicate Sontuul-Pride, Tolvan crippled the criminal organization and regained her rank of Captain. She even captured Aphra herself, sending her to Akkreskor Jail, but in the company of Aphra's droid Dek-Nil, thus allowing Aphra an avenue of escape. In the end, however, the escape Tolvan sought would be from Aphra herself. Blackmailed into rescuing Aphra from Akkreskor Jail, Tolvan again risked life and career to spare her lover's life. 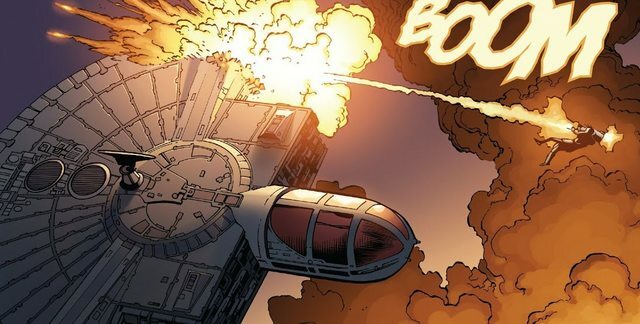 Tangling first with Aphra's former flame Sana Starros — even downing Starros' Volt Cobra starship using a well-placed rocket — Tolvan discovered that they were both there to ensure Aphra's safety, with Starros acting at the behest of the Rebellion. At Akkreskor too, Tolvan admitted her love for Aphra. And in a moment most dire, Tolvan summoned Darth Vader to the prison, in the hope of his arrival effecting their escape from the prison, as it plummeted to planetfall, using Aphra's knowledge of Vader's plan to ovethrow the Emperor as leverage to bring the Dark Lord to Akkreskor Jail. As Vader bore down upon them and seeing no hope of escape, Aphra volunteered that her own memory be wiped by the Mairan Bor present at the prison, but in the end, it was Tolvan who sacrificed herself, saying tearfully that "Vader's only here because of me. M-make me forget you. No more leads to follow. No one to blame... because I love you... And it's ruined my life." Sadly, Aphra did not think forgetting was enough. With her memories altered in a horrific fashion, one which changed Tolvan's memory of a noble sacrifice to one wherein she was made to believe she killed Aphra in a jealous rage, Magna Tolvan survived her encounter with Darth Vader, for the moment. Bound for further interrogation and likely eventual death at Vader's hand, Tolvan was then rescued by the timely arrival of Sana Starros and the Rebellion, who were again in search for Aphra for encrypted information she had earlier secured. Now in Alliance custody, Magna Tolvan is still armed with knowledge of Vader's secret, though she believes her beloved, Chelli Lona Aphra, to be dead. Description: Magna Tolvan is a female human with pale skin and pale silver-blue eyes. She currently has her silver hair styled in a mohawk, with the sides of her head shaved in closely-cropped fashion. Though the reasons are not widely known, at some point after joining the Empire and meeting her mentor, Inspector Thanoth, Tolvan came to require the use of cybernetics, a head and neck brace that extended to her collar and arms. 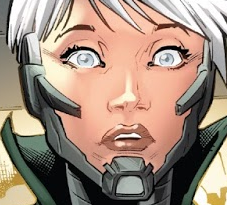 Though called "cute" by Doctor Aphra and regarded as "hot" by Sana Starros, Tolvan nonetheless feels insecure about her appearance and refers to her cybernetics as deformities. She is highly intelligent, driven and disciplined. Her expertise in Imperial protocol, combat strategy and tactics mark her as an outstanding officer, but it is only through rigorous discipline that she keeps her self doubt at bay. She seeks to create order where there is none, in the hope that doing so will settle her own inner turmoil. Tolvan carries herself with an aloof, superior air and she regards those without discipline with contempt. Equipment: Code cylinders, cybernetics (braces cover neck and back of head, collarbone, and arms), E-11 blaster rifle (5D damage, range: 3-30/100/300, ammo: 100, game notes: If the retractable stock and scope are used for one round of aiming, the character gains +1D bonus to blaster), EC-17 hold-out blaster (3D+2 damage, range: 3-10/20/40, ammo: 15), holo-communicator, holster, Imperial long-coat and uniform, rank badge. Sources: Doctor Aphra comicbook series and Wookieepedia. Stats and text by Telsij. Images: Doctor Aphra issue 22 ("Eyebrow Askew medium shot" artwork by Kev Walker), issue 16 ("Close-up" artwork by Emilio Laiso), and issue 4 ("Pointing" artwork by Kev Walker). Superb writeup! Great to see a Doctor Aphra mainstay. Thanks, Telsij and congrats on the job extension! Thank you for the kind words, Pel! And I do love Tolvan. Truly one of my favorite characters in New Canon. Capable badass, yet still relatable, conflicted and complex. And the illustration gig goes well thus far! After completing the boxcover for the tabletop game, along with card icon/symbol designs, for December 2018, I am now about halfway done with drawing characters in the likenesses of several Kickstarter backers, for mid/late April. Three of the eight are done, and I am about halfway through with the fourth as we speak! "Ugh. It's a long story with a tragic ending. We're visiting my mother." "Now, minding the store is simple, so pay attention... Customer's always right, take their money." "I really don't look a thing like my mother. My father was part Gungan, you know." Digitigrade Physiology: A Gozzo's wiry legs and toes grant him a number of advantages. to climbing/jumping and lifting skill checks. prompted to reply, "Why can't you be honest about your father for once. a crate of thermal detonators they armed then (temporarily) disarmed. often overrides their better judgement when it comes to considerations of safety and risk. parts, both routine and rare. his usual mood, the Gozzo provided a perfect complement to Orka's gregarious approach. flip-up lenses (when flipped down, lenses prevent flashblinding and protect eyes with +4D effectiveness). 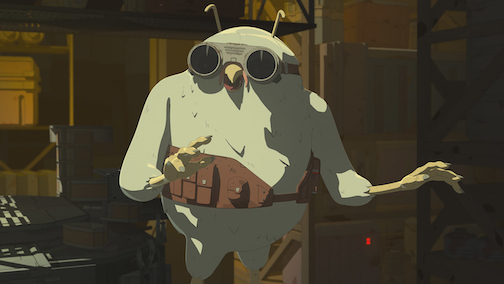 Sources: Star Wars: Resistance animated series and digital shorts, http://starwars.com, and Wookieepedia. Opening paragraph of Capsule Text adapted from http://starwars.com databank entry. Stats and text by Telsij. Conversions Aliens Stats (for comparison to Yuzzum, p.177). Stats and text by Telsij. I've had some players with that special ability. Cool writeup; very thorough. The Gozzo have lots of potential. Thank you! Thank you! And excellent point, I too have had players with that special ability — overpowered/unbalanced ability sometimes, haha. Here is an entry for the Solo sourcebook, an entry finally finished before having to buckle down to draw for hours again this weekend! A Quote: "Han couldn't have taken the route he did — the Falcon would have been torn apart. a couple of calculations first." route likely taken by Han Solo, for his record-setting Kessel Run. aim and angle for bigger and better things. Yet some insist that Fenris is all talk and little action. Which take is true? 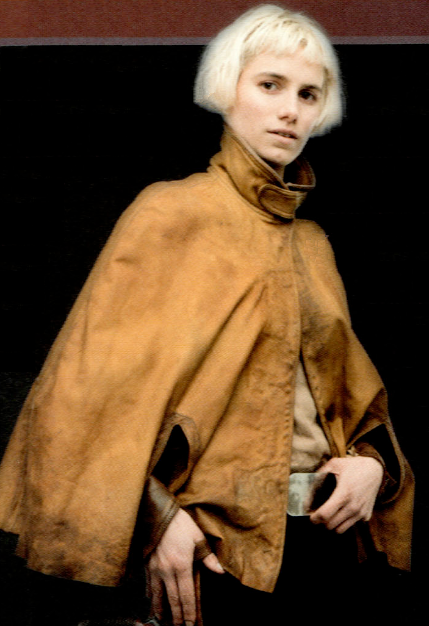 Capsule: A smuggler from Yir Tangee, with dark eyes, a pale complexion, and platinum blonde hair kept in a Mandalorian-style bob, Astrid Fenris has loftier ambitions, beyond whatever gains she garners in her latest scam. The pilot of a modified YT-2400 called the Silver Howl, Fenris’ current operation involves the export of (relatively) valueless Vandor ice, which she passes off as expensive R’alla mineral water to gullible customers who believe in the water’s promised rejuvenating properties. Unsatisfied with small-time confidence games, Fenris insists this is only a short-term scheme to help her settle some debts. In the decades after the Battle of Endor however, some say that Astrid’s bravado and bluster belied genuine ambition and drive, and that her early efforts actually laid the foundation of a legacy for the family Fenris, one that would long be associated with ace pilots — a tradition carried forward by Freya Fenris, starfighter ace and racer, aboard the tactically-critical refueling station known as the Colossus. Equipment: Comlink, metric tons of Vandor ice, Modified CEC YT-2400 light freighter: Silver Howl (Stock stats except: Hyperdrive multiplier: x1; Space: 6; Atmosphere: 330, 950 kmh; Cargo capacity: 121 metric tons — inclusive of modified cargo holds; Equipped with: 5 tons of hidden cargo compartments, refrigeration equipment for precise temperature control of 20 ton capacity cargo hold), Prax Arms Ophidiax-350 heavy blaster pistol (see separate entry), synth-hide capelet with concealed pockets (+1D to Hide rolls for small objects), utility belt and holster. Sources: Solo: A Star Wars Story film, Solo: A Star Wars Story: The Official Guide (p.87), Tales From Vandor book, and Wookieepedia. Capsule text adapted from Solo: A Star Wars Story: The Official Guide (p.87) and Tales From Vandor (pages are unnumbered). Stats and original text by Telsij. OK, finished one more already-in-progress entry before having to go back underground! 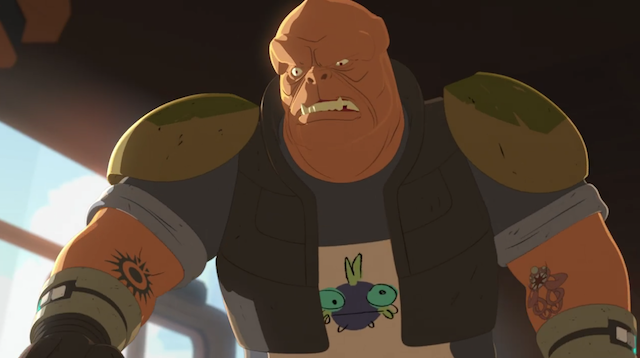 Stats and write-up for the absolute unit that is BOLZA GROOL, from Star Wars: Resistance. Instantly liked this character and the idea of a mob enforcer (what with that Black Sun tattoo and all) who had gone legit to run a little fishmarket. And for a food vendor, it's pretty great that his name is a play on words for "bowls of gruel." Included revised species stats for the KLATOOINIANS, not only to allow for a higher peak in physical strength (at the cost of some footspeed), but also to add story factor and game effects for the Klatooinian Trade Guild, which incorporates aspects of its EU history for new canon. A Quote: "Step aside! I've fed people to the fish for less than that!" Burliest Brawn: Bolza Grool is amongst the largest and strongest of Klatooinian specimen, able to lift and pitch people into the air easily, as well as able to punch an imprint of his fist into a metal plate without batting an eye. However, the sheer size that affords him such physical strength comes at the cost of a lumbering gait. In game terms, every +1 that Bolza Grool exceeded 4D in Strength, incurred a -1 loss from his species' typical Move score of 10. Growl: Due to their canine evolutionary heritage, Klatooinians will sometimes express their displeasure or anger via low, guttural sounds. In game terms, these vocalizations grant Klatooinians a +1D to their intimidation attempts, when used. Klatooinian Trade Guild: Originally conceived as an organized way to provide Klatooinians the opportunity to work on planets far from Klatooine, the Trade Guild has felt the Hutt Cartel's heavy influence upon the Klatooinian species and over the Outer Rim overall. Although known to hire freelance smugglers and them fairly — half the fee up front if negotiated, the Trade Guild has become a two-edged sword for the Klatooinians themselves. While the trade organization is still included by smuggling luminary Platt Okeefe, on her list of potential clients in the Smuggler's Guide, a number of the Guild's branches have become a front for shady Hutt endeavors — including smuggling, loan-sharking, and slaving. Worse yet, because of the Klatooinians historical ties to the Hutts, after a few wrong moves, many Klatooinians found themselves indentured to the Hutt Cartel. In game terms, Klatooinians gain a +1D bonus to their bureaucracy and streetwise skills rolls when dealing with the Klatooinian Trade Guild. However, because of the now long-entrenched influence of the Hutts, their bargain attempts with the Guild suffer a +1D penalty to their difficulty, and failed bureaucracy rolls come with greater, often hidden consequences. Capsule: Racers who dodge their commitments are likely to encounter the lumbering Klatooinian muscle Bolza Grool as he's tossing them off the side of the Colossus refueling platform, head first. The burly, broad-shouldered Grool makes his living selling gorgs in the marketplace, though he's also counted upon to act as bouncer at Aunt Z's Tavern — though more so as enforcer for the gambling that goes on within. And while Grool does not appreciate being mistaken for a(n albeit massive) holo-dart board, his rage at the errant throw of Kazuda Xiono — self-proclaimed "best pilot in the galaxy" — did not prevent him from seeing the sense in Kaz's offer to advertise Grool's logo on his racer... in exchange for the Klatooinian not crushing him, of course. Equipment: Apron with hand-drawn Gorg logo, assortment of live Gorgs, aquatic livestock gear (three large water tanks, cylindrical open-topped fountain-like vat), black vest, cobalt-blue shirt and pants, shinguards and metal-toed boots (+1D vs. physical, +1 vs. energy; covers lower legs and feet only), shoulder pads (+2 vs. physical), various tattoos (Black Sun symbol on inner right forearm, Exogorth — aka "giant space slug" — on outer left forearm, Rathar on inner left forearm, et cetera), "sponsorship deal" with Team Fireball, "To go" Gorg containers, vendor's stall in Colossus marketplace (located at the very end of the Colossus' A Quadrant marketplace, right next to several refuse dumpsters), work-gloves with forearm bracers and comlink (+1D vs. physical, +1 vs. energy; covers forearms only). 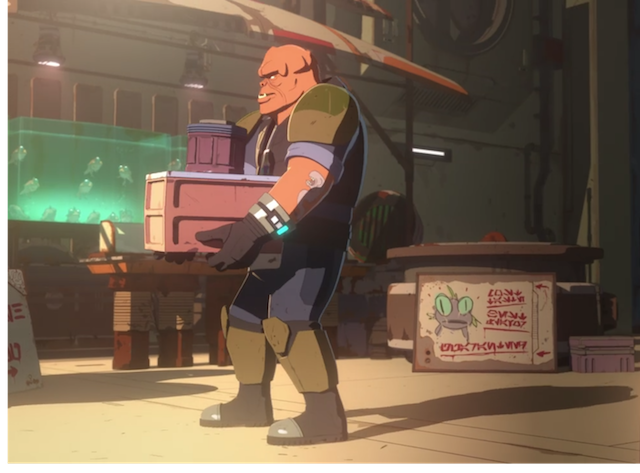 Sources: Star Wars: Resistance animated series and digital shorts, starwars.com, and Wookieepedia. Capsule Text expanded from starwars.com databank entry. Stats and text by Telsij. 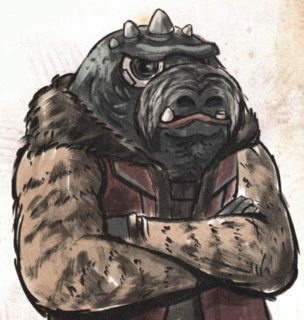 Burliest Brawn: The largest and strongest of Klatooinian specimens are able to lift and pitch people into the air easily, and punch imprints of their fists into metal plates without difficulty. However, the sheer size that affords them this physical strength comes at the cost of a lumbering gait. In game terms, at character creation, for every +1 that a Klatooinian PC exceeds 4D in Strength, he incurs a -1 loss from his species' typical Move score of 10. 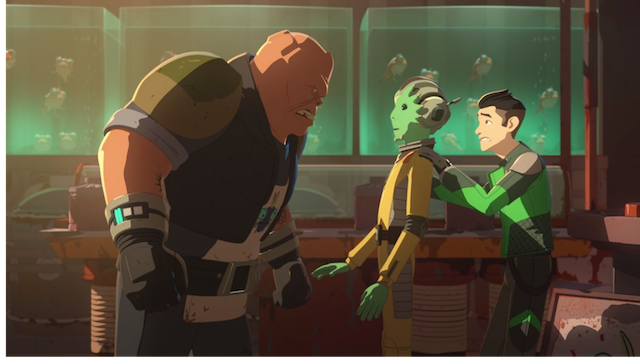 Sources: Star Wars: Resistance animated series and digital shorts, starwars.com, and Wookieepedia. Revised stats and text by Telsij. along with some game mechanics for electro-tattoos! Electro-tattoo: Depending upon the purpose and complexity of the design, electro-tattoos can carry data, complete circuits, or carry out security-overriding, sensor-baffling effects — though the latter capabilities are not widely known to the law-abiding public. For example, the electro-tattoo on the right arm of rogue archaeologist Doctor Aphra’s once allowed her to circumvent and/or short-out electronic security measures, while a matching tattoo, though on the left arm, acquired later by Imperial Inspector Magna Tolvan, allowed the couple to communicate securely through a prison’s energy barrier. In game terms, electro-tattoos can carry data, can complete circuits or disrupt currents, and can facilitate transmission of signals. If the desired effect is a security measure or countermeasure, the tattoo is given a die code effectiveness. Creation of electro-tattoos requires that the tattooist have at least 5D in the following skills: Artist: Tattooist, and communications, or computer programming, or security (depending upon the specific effect desired, and if electronic security measures come into play). The maximum die code of an electro-tattoo’s effects is the artist: Tattooist skill level. Successful creation of the effect is determined by an opposed roll of the Tattoo artist’s skill against the die code of the desired effect. Capsule: The multi-talented Naley Frifa was rarely short of work. As an outlaw tech, Frifa frequently made illegal modifications or repairs to starships and equipment — but she was a skilled tattoo artist as well, adept at crafting both gang symbols and data-carrying electro-tattoos. She herself bore a stylized depiction of a hyperspace simu-tunnel along her neck, collarbone, and right arm. 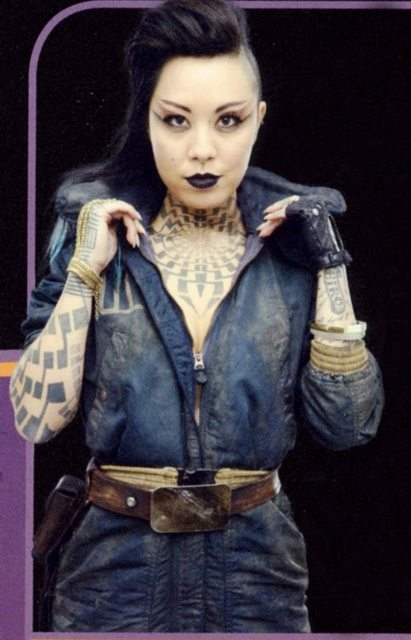 Equipment: Blaster pistol (4D damage, range: 3-10/30/120, ammo: 100), electro-tattoos (including stylized hyperspace simu-tunnel along neck and collarbone, and the words “Hiro” – thought to be the name of her son — on her left forearm; for electro-tattoo rules sidebar/below), hooded jumpsuit, tattooist equipment (disinfectant, hypo-needles, inks, etc), toolkit, utility belt, work gloves. Sources: Solo: A Star Wars Story film, Solo: A Star Wars Story: The Official Guide (p.86), Doctor Aphra comic book (issue #21), and Wookieepedia. Stats by Telsij. Capsule text adapted from Solo: A Star Wars Story: The Official Guide (p.86). Nice. I've seen other ideas for high-tech tattoos in sci-fi settings, such as tattoos that can be turned on or off, and are used as "membership cards" for elite organizations. In the WH40K Inquisition War novels, the Inquisition used "electoos" that were invisible when deactivated as proof of membership to the various Ordos of the Inquisition. Other uses included things like a functional "digital watch" implanted in the skin of a forearm, or decorative "ripple" effect tattoos that pulsed in time with the wearer's heartbeat.